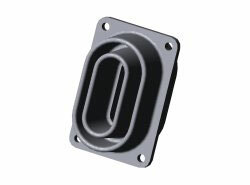 700 Series Wall Bushings are generally designed for use as bus entrance and cell transition insulation in switchgear applications. Numerous window configurations are available to suit most bus sizes. 700 Series Wall Bushings can be used in direct mounting to conductive surfaces or in conjunction with other insulating materials for higher voltages.